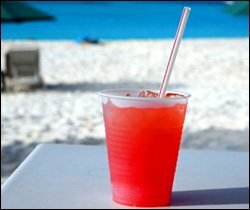 I can’t begin to guess how many times I have been asked for the famous…or infamous Sunshine’s Killer Bee Recipe.Â While this is not exact, it is damn close…after a few you won’t notice anyway :)Â It is not a Nevis vacation without one of these. bitters to taste (Angostura bitters) can be found in grocery store. Watch out these pack a punch! I did a windjammer cruise about five years ago. One of the stops was Nevis during which we went straight to sunshine’s beach bar for the killer bees. It was one of the most memorable experiences of the entire week and when I return there some day I will make a beeline for sunshine’s again! I think the rum punches at the Nevis botanical gardens restaurant are the best. Does anyone have that recipe? ok you forgot the nutmeg the sprinkle it on top! Oh well, this recipe at least lets you dream of Nevis and Sunshine’s Beach Bar. Thanks for the tips and input. I have been looking for passion fruit juice in los angeles for months now. I’ve found Passion Fruit Puree, and syrup. The Welches, Passion fruit/Grape sometimes taste right if you add a lot of honey. the killer bee does the job, i got back from nevis yesterday and stayed at the four seasons, it was beautiful and i highly recomend it, and the killer bea.